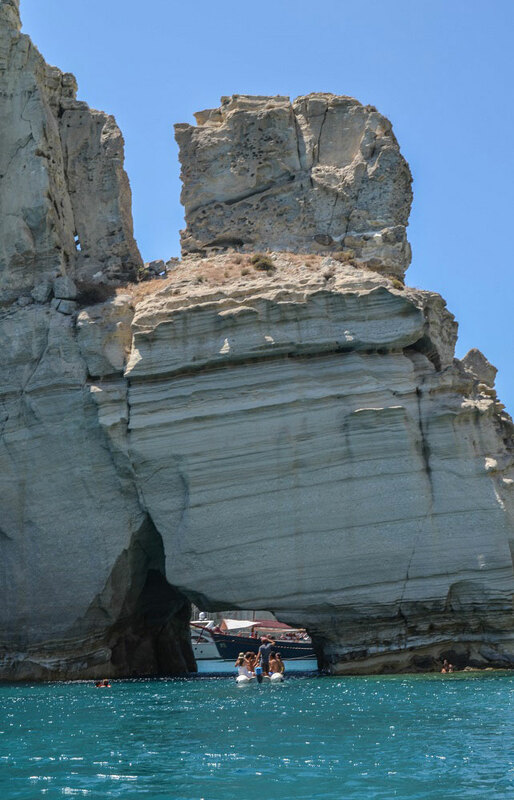 This ultimate speed boat adventure tour will take you to see the best that Milos island has to offer, if you are into cave exploration and dramatic rocks coming out of the sea, swimming through the underwater sea passages, snorkeling in the crystal turquoise waters and enjoying the summer breeze while the sea drops splash against your face. 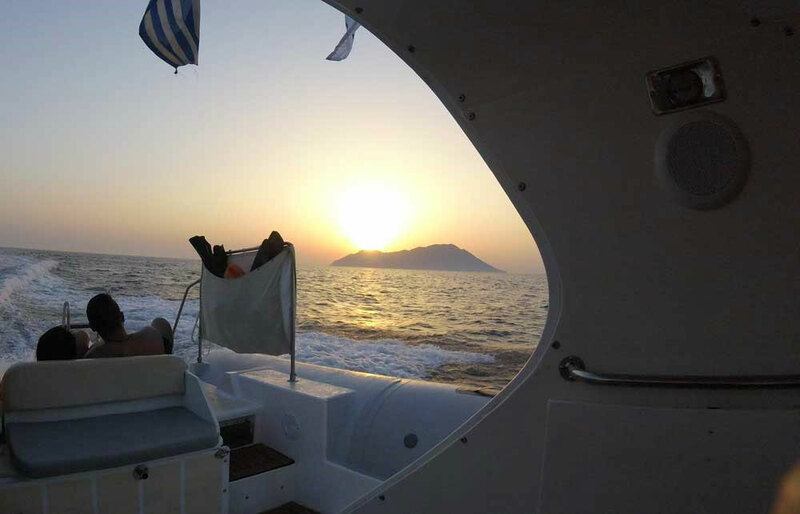 You will start you cruise from Adamas port and head towards the famous Kleftiko, a unique volcanic landscape that has been a pirate hideout for centuries. 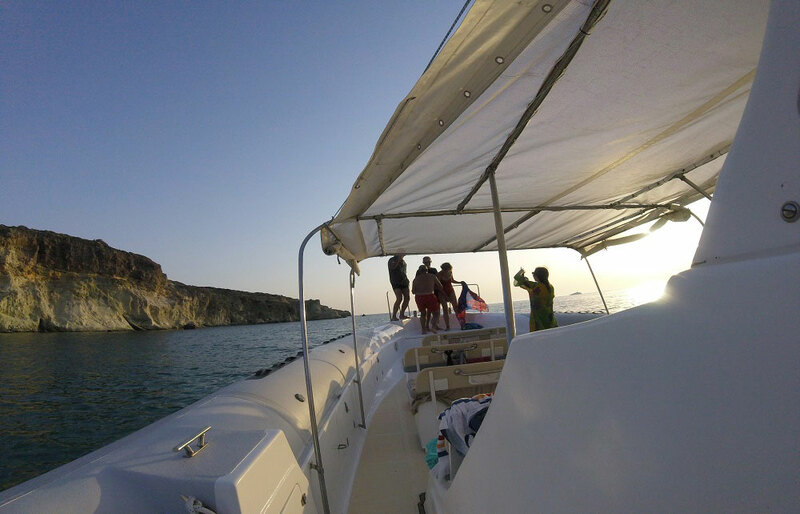 You will get to discover Milos’ most mesmerizing landmark by going on a snorkel safari to explore the fascinating caves and exiting underwater passages. 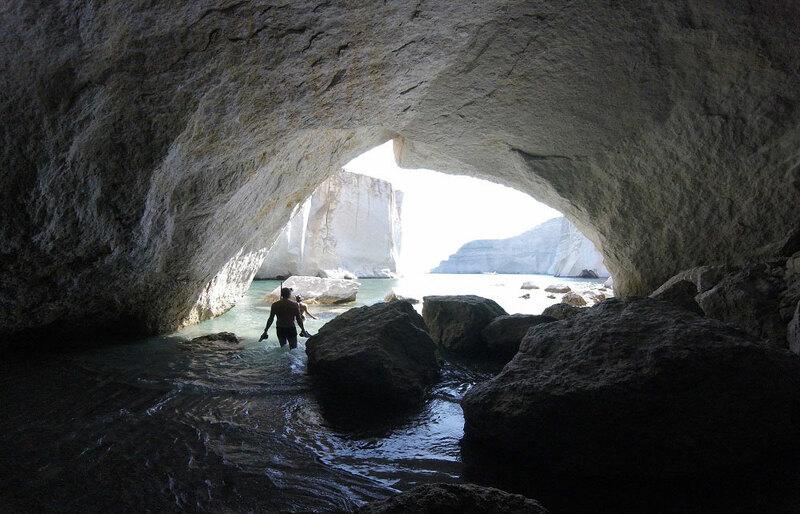 Next you will stop to the impressive Sykia cave, one of the biggest sea caves in Milos. Sykia will captivate you with its peculiarity. Its ceiling has partially collapsed, probably due to an earthquake, and sun rays enters the cave and light up its crystal emerald water. 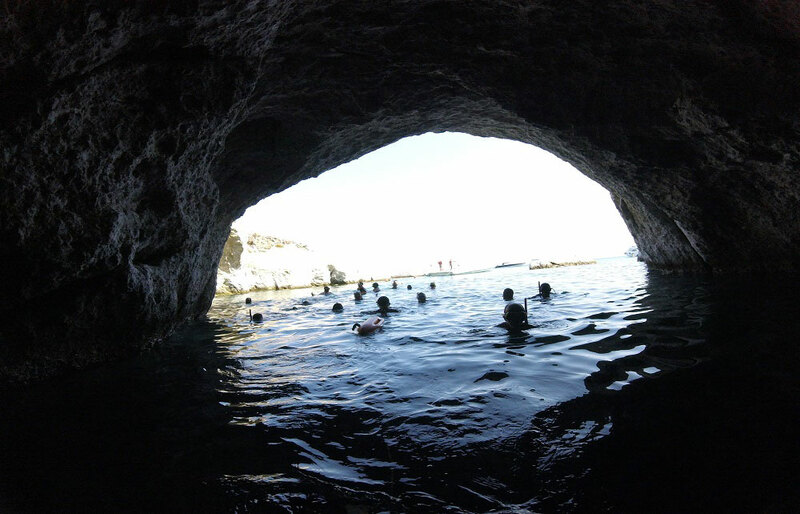 The cave leads to a small beach which you can easily reach by swimming. Here you can enjoy the breathtaking scenery, dive in the emerald waters and have a delicious snack onboard. 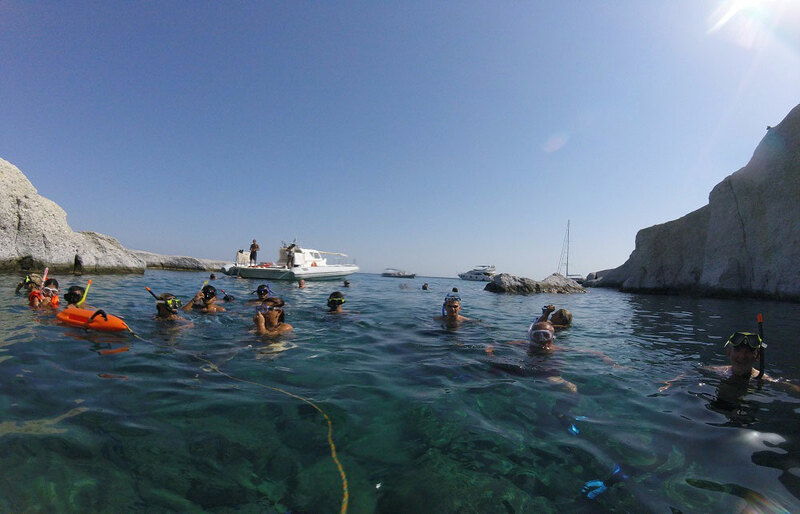 You will continue further to Kalogeroi beach for another swimming stop, before you return to Adamas port, where you will be given a CD with the best action camera photos from your trip! Depending on the weather, an alternative boat tour may be followed. By taking the south route, you will experience an explosion of colors along the coastline due to the differences in the natural geological setting. 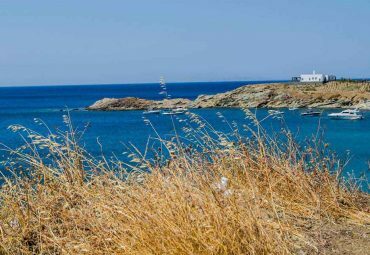 In such case you will start from Paleochori, known for its red volcanic color and therapeutic waters and cruise along the stunning south coastline of Milos in order to reach Kleftiko. 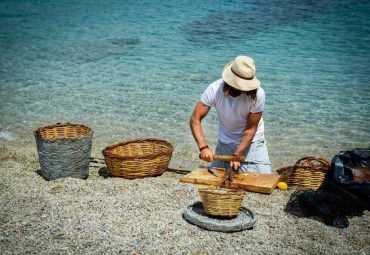 You will pass by Tsigrado, a true paradise for adventure lovers as the beach is accessible only by the sea or climbing down a thin wooden ladder if you come from the shore. Next, you will head to the famous Firiplaka comprised of yellowish – white rocky formations and idyllic beach setting which is very popular among tourists; further you will continue to Agia Kyriaki and its darker sand and turquoise waters, pass by Provatas beach with its thin yellow sand, reach the impressive sharp white rocky formations at Gerakas and finally get to the worldwide known Kleftiko to admire its mesmerizing beauty. 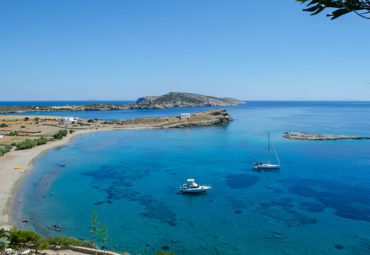 There are two different routes which the excursion can take, depending on the weather, either starting from Adamas to visit the west side up to Kleftiko, or starting from Paleochori to visit the south side and end in Kleftiko (both are weather permitting). Please note that the itinerary may be reversed or the schedule altered based on prevailing weather conditions. 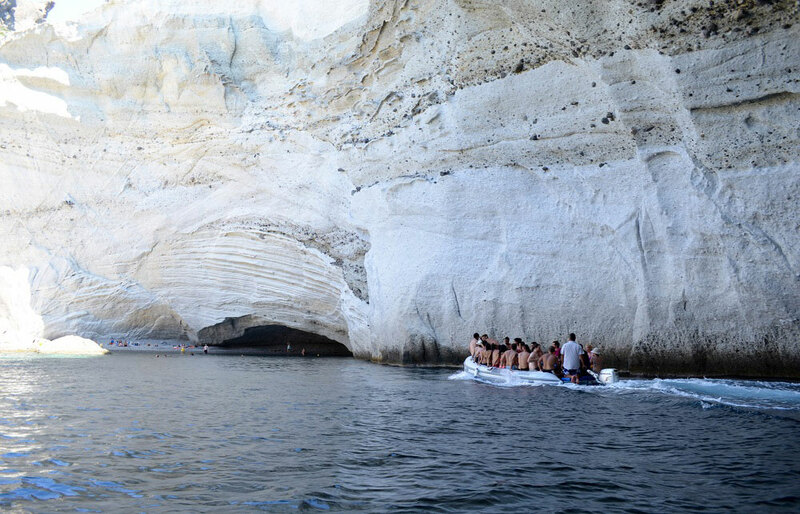 However, whichever route the tour takes Kleftiko will not be omitted from the excursion. This tour is organized (group) with minimum number of participants 10. Children (1 – 10 years old) and infants are welcome to participate with parental guidance. Please remember to prepare a beach bag (with bathing suits, beach towels etc) as we will be making swimming stops along the way. All boat tours are weather permitting and may be a subject to change without prior notice if the prevailing weather conditions do not allow for a safe trip. 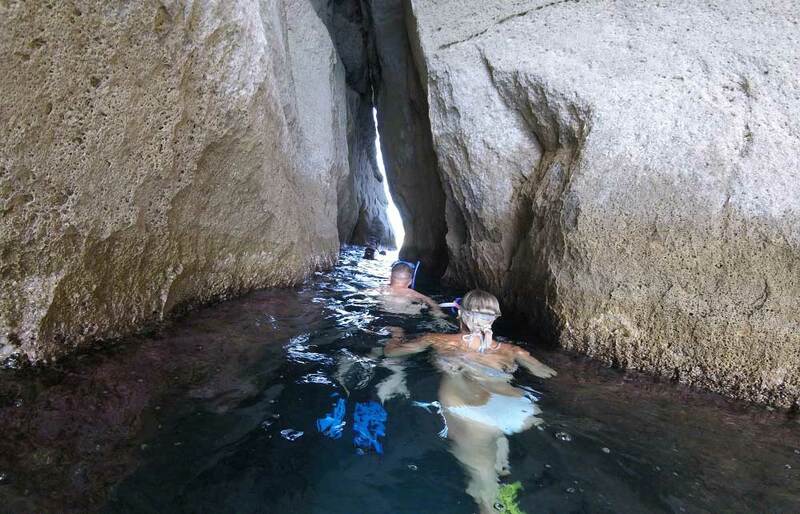 A true summer thrill of a fast boat ride, exploring caves and snorkeling thought deep underwater sea passages. A must do for adventure lovers! 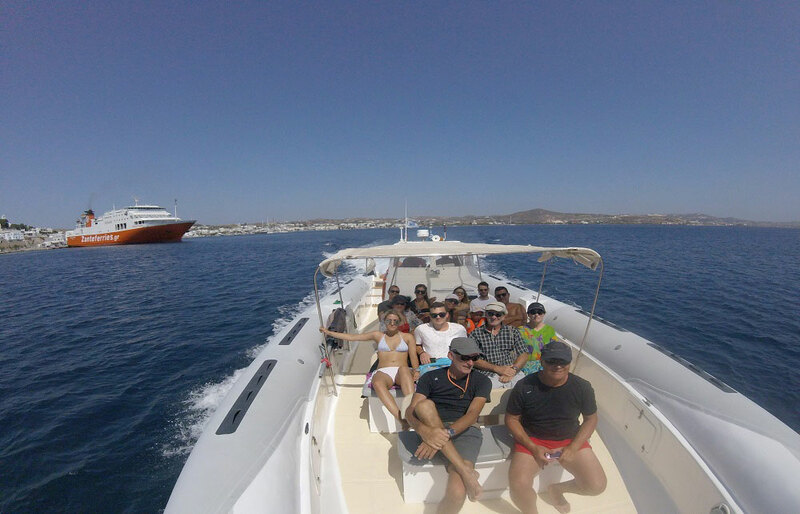 We booked a Milos island cruise with Jana and it was amazing! 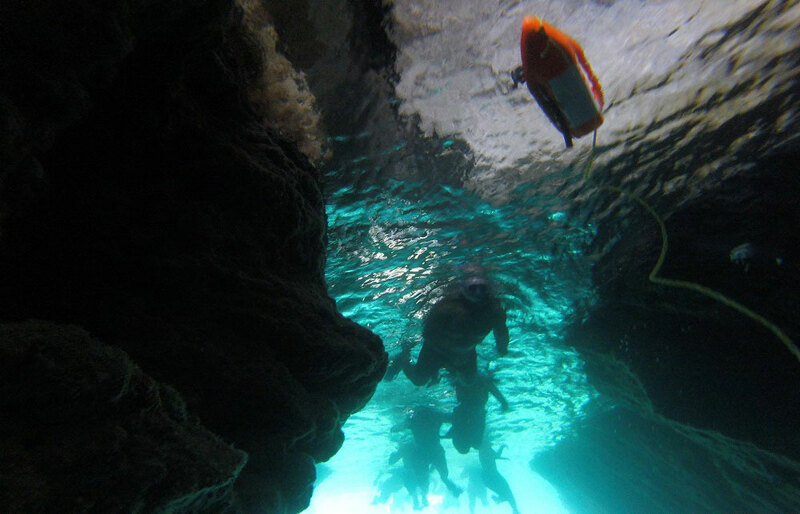 We snorkeled through caves and swam at hidden beaches. They wined and dined us and even sent us a CD with photos of the day. We loved our hosts too! Jana went above and beyond in helping us book, advised us on ferry schedules, found us a deal on a car rental and even gave us advice about where to go and where to eat! (Gotta try the swordfish souvlaki at Medusa in Mandrakia!) I can't say enough about her service! Thank you, Jana, and we can't wait to book our next adventure through you! !